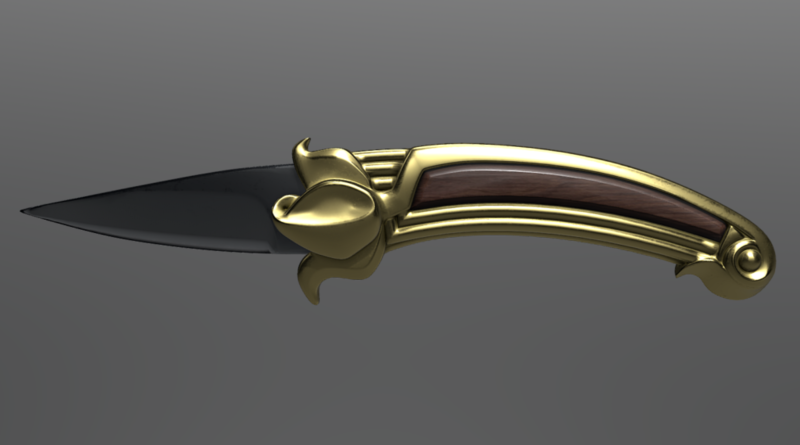 I’ve had recently the sudden idea that I could make my knife’s design as a 3D model, preparing the model specifically for 3D printing. This looks like a random idea, but it really comes from the passion for swords and knives, that left me in the past often unsatisfied from the little number of designs that could be found, and for the steep price for items that had little ornamental value, a low level of details and extremely poor quality materials. For this very reason I’ve never bought a sword even though I always wanted to. But now, with the advent of accessible 3D printers, their now wide diffusion, and the renewed interest of people for arts and crafts, we’re able as never before to create new designs and bring them to other people that would love them as we do. With this in mind, I decided to create my own series of epic weapons: swords, daggers, war axes, and any other that I may be inspired to create, in any style, from fantasy to sci-fi, just as ideas flow! I will publish all new designs, but I will make them available for 3D-printing at a slightly later date. My aim is to make different sets of files for every weapon, with a basic set that is intended for just printing and assembling, and a “maker’s set”, with separated files intented for reproduction of the design in the real materials, that for example in this case would be a 3D model of the handle for lost-PLA/lost-wax casting, and 1:1 scale plans with additional details and explanations to craft the blade and the wood inserts. This is, then, the first of my weapons: are you tired of seeing all steampunk and 1800-themed stuff look the same? Well I am, since late 1800 was a very creative period, full of revivals of old styles, and creation of new ones, and Art Nouveau is one of them, having its peak between 1880 and 1900, it was inspired by natural shapes, rich of fluid curves and flowery details. This is the Art Nouveau knife! This is a render with a plain light gray color, to give a better idea of how it could look just printed and assembled!